If an estate in question is smaller than the limits established by state law, then the estate can be administered under Small Estate Administration proceedings. All you need is a free Small Estate Affidavit form and your loved one’s information. With a Small Estate Affidavit form, you avoid the time-consuming probate process with, not only, less cost and paperwork, but also a lot less time. You will also need to state your relationship to the deceased. Small Estate Affidavits are mainly used by beneficiaries like a spouse, a guardian for minor children, adult children or parents of the deceased. 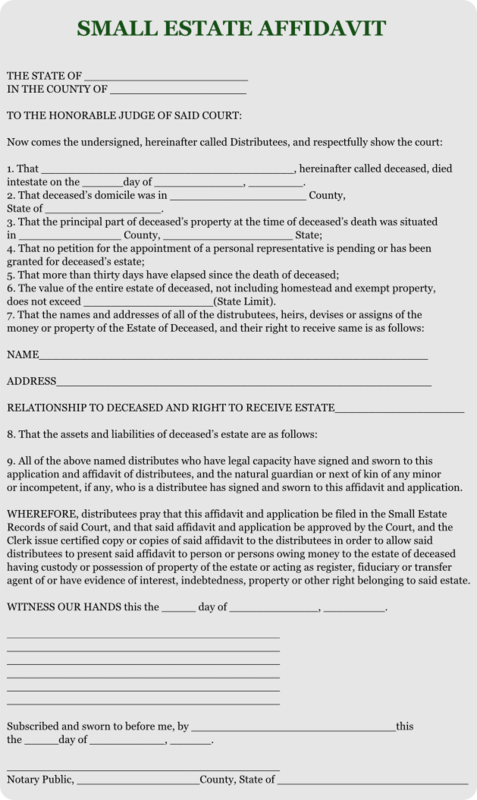 Once you complete the Small Estate Affidavit form, you file the form in the local jurisdiction where the decedent passed and the property is located. 1. That _____________________________________, hereinafter called deceased, died intestate on the ______day of _____________, ________. 2. That deceased’s domicile was in ____________________ County, State of _________________. 6. The value of the entire estate of deceased, not including homestead and exempt property, does not exceed ___________________(State Limit). 9. All of the above named distributes who have legal capacity have signed and sworn to this application and affidavit of distributees, and the natural guardian or next of kin of any minor or incompetent, if any, who is a distributee has signed and sworn to this affidavit and application. WHEREFORE, distributees pray that this affidavit and application be filed in the Small Estate Records of said Court, and that said affidavit and application be approved by the Court, and the Clerk issue certified copy or copies of said affidavit to the distributees in order to allow said distributees to present said affidavit to person or persons owing money to the estate of deceased having custody or possession of property of the estate or acting as register, fiduciary or transfer agent of or have evidence of interest, indebtedness, property or other right belonging to said estate. WITNESS OUR HANDS this the _____ day of _____________, _________. Subscribed and sworn to before me, by ______________________________this the _____day of ___________, ______.